AJ7O - Dave's BC-610 had a problem so N6YW - Billy, W8VG - George and I went over and, with Billy's expertise on those hunks of iron, managed to get it back on the air. It would appear that it has a bad fuse holder. George was returning the OSHA-non-compliant monster tuner he had modified to make a bit more accomodating on 160. Anyway, we finished up at the Italian restaurant, as usual. We had another great meeting at AJ7O - Dave's place. One of his neighbors is a new ham, KI7RSR - Edward. Edward is the guy that K7IOU - Dave and I visited a couple years ago and came home with a pick-up truck load of tubes, literally. He is an electronics guy and specializes in Audio mostly, but he has a troth of treasure at his QTH. Anyway, welcome to Amateur Radio, Edward, and maybe you will be an AMer when you grow up! And, as usual, after the meeting, we had a sandwich at great Italian place and headed back home. It was fun, as usual. Well hell, at least I got W7YAZ - Frank in the group pictures and then, there was W7MD - Doc Damon and WA1KNX - Deano, who showed up for lunch, of course. Porcia, no? I dunno', curious none-the-less. THIS ONE, should handle it, don't ya' think? George built this for Dave! 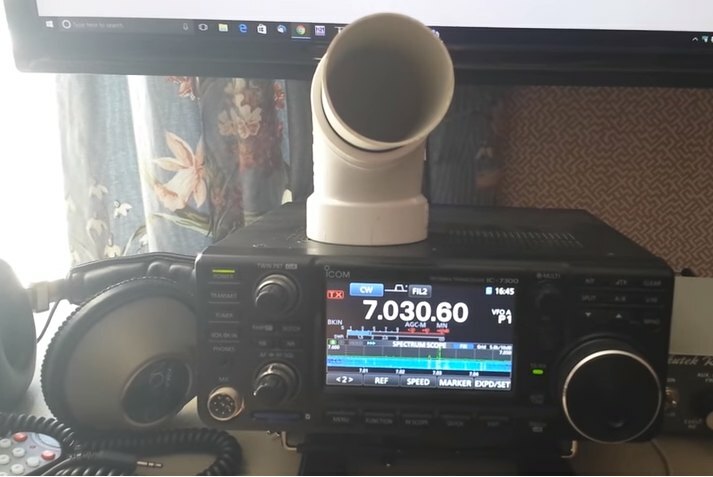 Did you make the Oro Vally HamFest? If not, you missed a good one. The AM group had a good time, as usual. Here's a link to a bunch of pictures. The other day I ran into this on You-Tube here: and I sent the link to Dave. He ended up making one and he says it works great! His looks a little different, hey, what ever works! Those darned cats will get anywhere if you let 'em! Won't they, Dave? Anyway, we did it again. We had the largest group of AMers ever to show for our monthly AM is King meeting. 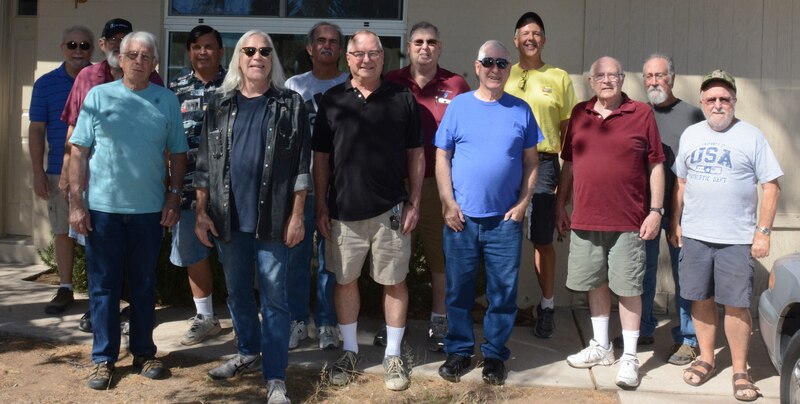 This time it was at AJ7O - Dave's QTH in Corona de Tucson and we had 14 of us, counting Don. We had the pleasure of welcoming KA7ISV - Jan all the way from Mesa and K6PYP - Scott from here in Tucson, both for the first time at our AM group meeting. 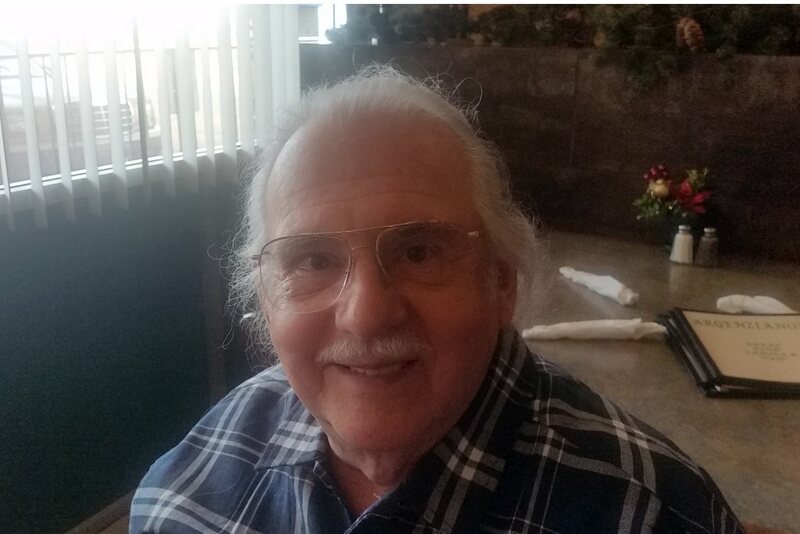 We had a nice visit and then retired to the Italian joint there in Corona de Tucson and had a great lunch! We had a new server, Ann, who did a fine job of handling the whims of 14 old farts, right Dave? Wish you could have been there! Showing the calls of the folks for this meeting! Frank, I gotta ask, what in the hell were you doing in that picture of me that KA7ISV - Jan took at the restaurant? Fifi was at it again this weekend with an airshow setup of their ART-13 and BC-348. I managed to work Loney - W0GZV and WA5SWC - Gary on set up day, 5 October and all three days on 20 meters (14.286) and 40 meters (7.295) too. 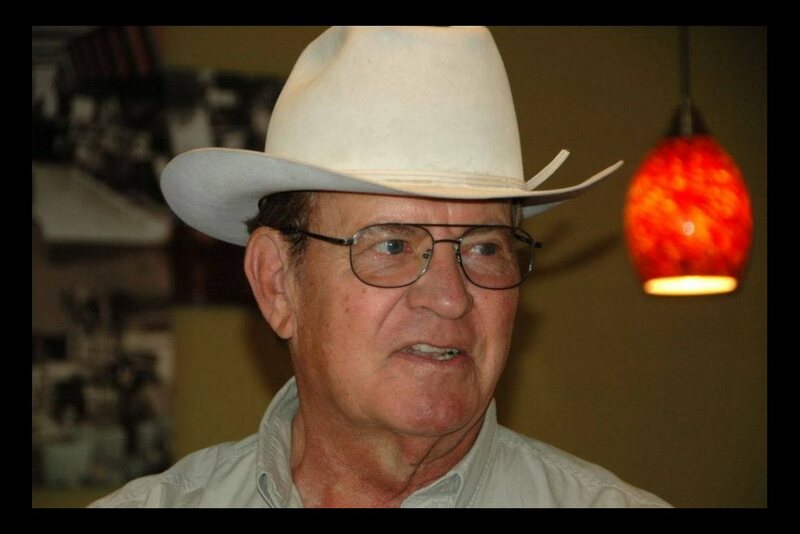 I passed the word, however, as far as I know of our group, only W8VG - George worked him Sunday morning on 40. You guys are slipping. 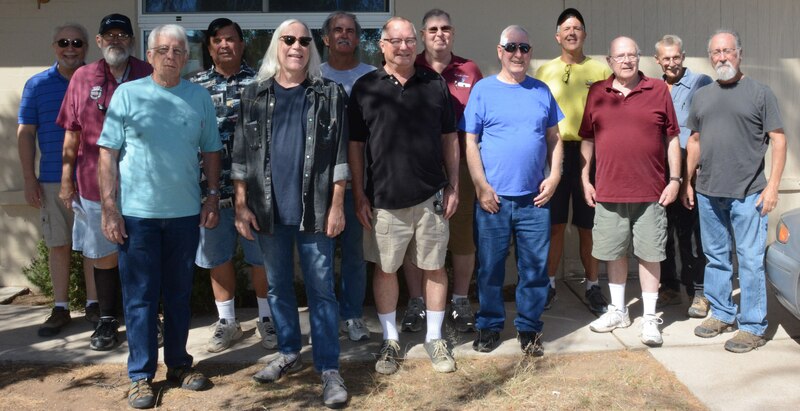 L-R: WQ5Q - Kelly, AJ7O - Dave, W7YAZ - Frank, W8VG - George, N6YW - BIlly, W1KSZ - Richard, WD7F - John and K0ETD - Ron. The picture below is the same except Don is replacing WD7F. We did it again! This time we met at W8VG - George's QTH and a great time. WQ5Q - Kelly came down from the San Tan Valley and afterwards we headed for Baggins for a sandwich. WA1BZQ - Bruce showed up at Baggins, couldn't make it to George's in time. 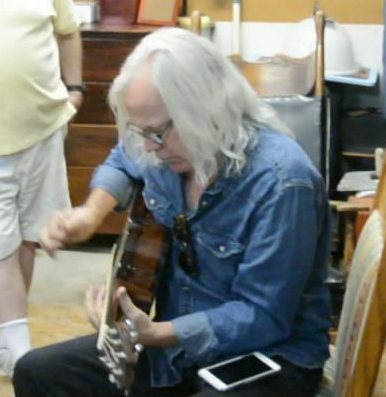 Mike had been having some medical problems over the past few years with the onset of Parkinson's, however, he had been carrying around an inoperatable pulmonary aneuryism for years. Lillian said he had trouble getting from the car to the house and she had to help him. He went for a nap and when she went to wake him, found him. He had sat up, put on his glasses and took one step toward the bathroom and that was it. Sorry to see Mike go, but if you're gonna' go, that's the way to do it. W0LTL (SK). RIP, Mike. What, Kelly? Are you trying to show some 'RESISTANCE' so us? Hey! We ain't DUMMYs you know. Finally! The girl from called and said the case for the Globe King was finished. I went down and picked it up and had to help them put the casters back on it. Amanda, the owner and painter, did a fine job on it. It's not as silver as the spray can hammertone was, but it's very nice and it should be tough as hell. I pushed the drawers in and hardly made a mark. I'll tell you one thing, if it doesn't move, they can powder coat it. 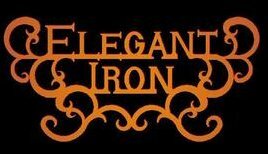 I highly recommend the place. Gave the cursory check and didn't have any modulation. Then, after I smacked myself in the forehead, put the 811 modulators in there and guess what? It works! Here's that 75A2 that W1KSZ - Richard has been working on for a hundred years (it seems like). Looks pretty good, right? He'll be getting rid of it now, probably, huh, Richard? 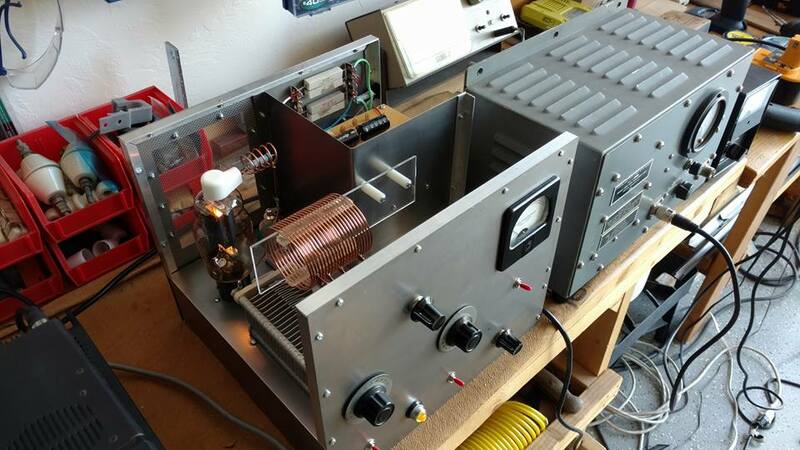 Pictures and comments by W8VG - George : This baby is a fantastic home brew project by my neighbor Ron K0ETD. 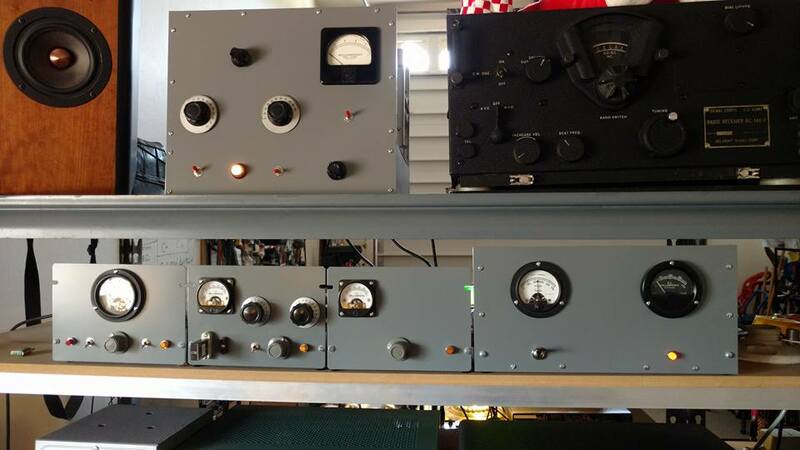 Very buzzardly open rack style transmitter--RF deck on top and power supply/modulator on bottom. RF deck is 6AG7 osc driving 6146. Modulator is pair of 5881s. 80/40 bandswitching -- puts out abt 60-70 watts carrier. Finished in professional-looking hammertone with nice white labels. Ron loaned it to me for a couple days so I could put it on air and he can check it out--we're abt 4 miles apart as crow flies. Not mine to keep but he'd better get over here quick to pick it back up as I'm having too much fun! Hihi! Definitely some inspiration for my next home brew attempt. Been a while since I posted anything. No news is good news, right? Well, here's the bad news. My near 70 year old Globe King 500's modulation transformer finally gave up the ghost. I'd been babying it for three years or more but, it finally ran out of lives. It's at Gary Brown's and here's his pictures of the damage. Hope to have it back in a week or so! 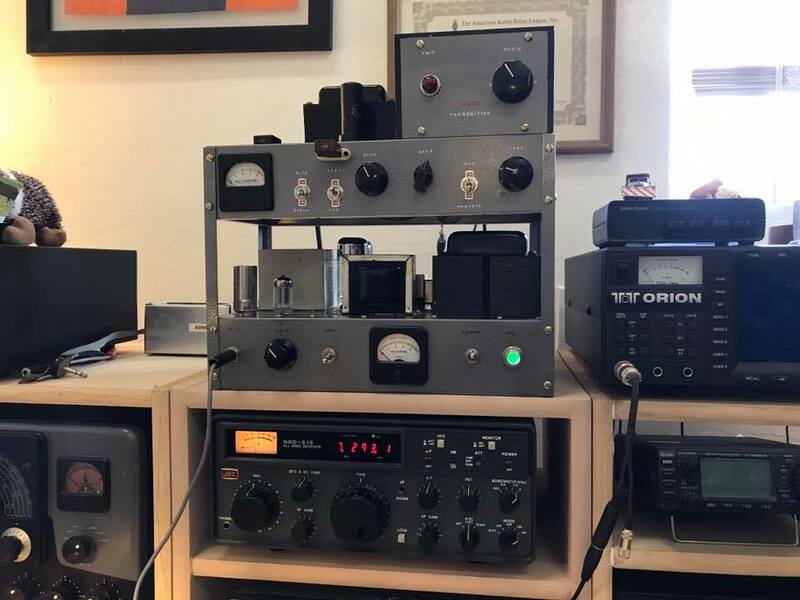 Another good meeting out at AJ7O's Corona de Tucson radio shack where we saw his NC-303 and other goodies as usual. Too bad N7YW - Billy and K0ETD - Ron couldn't make it. Lunch was good too! There the pictures are in no particular order. So, W1KSZ - Richard wasn't satisifed with his little 2015 Mercedes Hard Top Coup/Convertable, oh no, he had to go and buy this thing, a 2017 model with every bell and whistle imaginable. I told him he had about as much use for this as he would a mistress. Oh well. Finally completed 811A linear project. Painted panel to match other HB gear and did some final adjustments to rf tank circuit. Now using it to beef-up my 6 watt PW rig (5763 modulated by 6AQ5s). Does 45-50 watts carrier with full modulation when I hit the "panic button" during a PW QSO. Thinking about my next project--may build cab for it--but also have a few boatanchors awaiting some TLC as well. No shortage of projects! Worked KJ7USA on 7.293 this afternoon and realized that he's not in the gallery. John in active duty Navy at Pt. Magu and will retire in about 3 years, he says! Then, he's heading for Arizona. I see a National, a Heathkit, a HQ-170 & a HQ-180 and of course, the Valiant. Looks like he's pretty well equiped. It was that time again. We had an AM meeting at AJ7O - Dave's place and after checking out his 75A-1 and other acquisitions, we had lunch at . Yeah, it's all good. We had a guest today, K6WSC - Bill who lives on East of Dave about 4 miles showed up and got to eyeball all of us oldtimers. 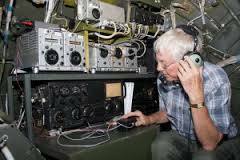 N6YW - Billy and myself were invited to his QTH after lunch to check his shack. Maybe we'll make an AMer out of this DX Contester! Who knows? Anyway, we had a good time as usual. Guess what! Our man, K3YAZ - Frank, decided to join the 7-Land group, found the call W7YAZ available on the list and applied for and, voil�, he received it yesterday! Good deal, Frank. Now to learn to say it. He only messed up once this morning on the 3725 group! The RST Hamfest was a success and we had a good turnout of AMers. WB7AM - Bob motored down on his bike and we finally had an eyeball with him. Here's a link to the hamfest if you haven't seen all the pictures. 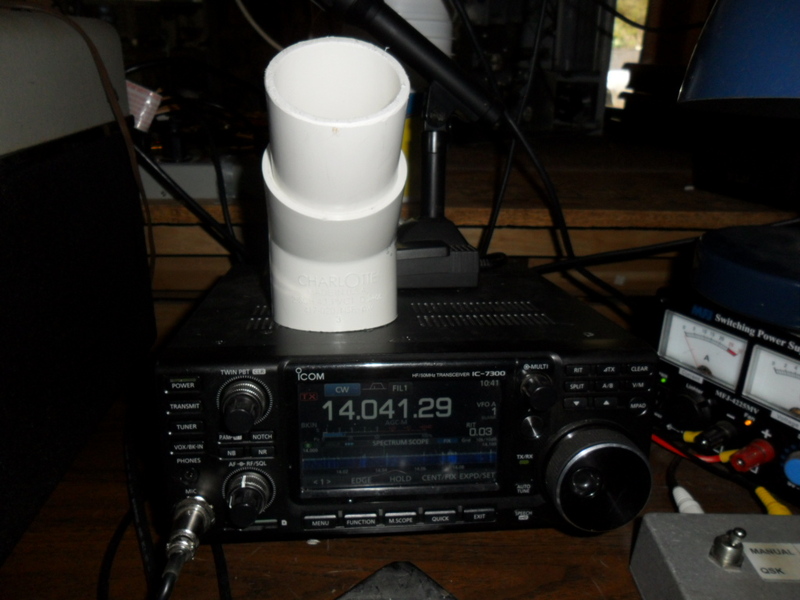 Here is my only acquisitiion from the hamfest, $15 and I might have got it for less, but... It's Shure KMart Special with a noise cancelling mike you can still buy the head for $130. 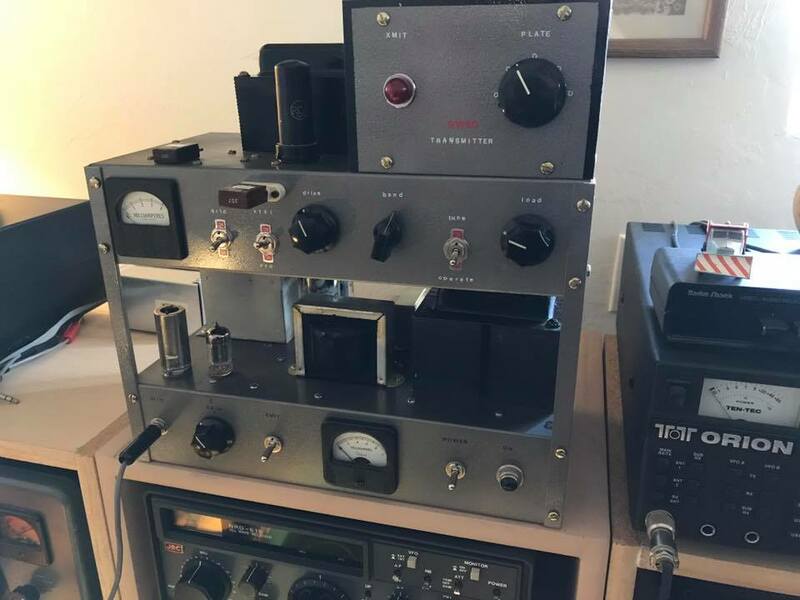 Someone had built a preamp for it, and maybe it was used for that. I replaced the defunct element with an electret capacitance mike and it needs some tweaking still. Anyway, I like it! Guess what the screens are for on the shelf back there. It's to make it Kai Noah proof. Here's that T-150 of K3YAZ's that now has a new home. W1KSZ - Richard picked it up today at our Corona de Tucson meeting. 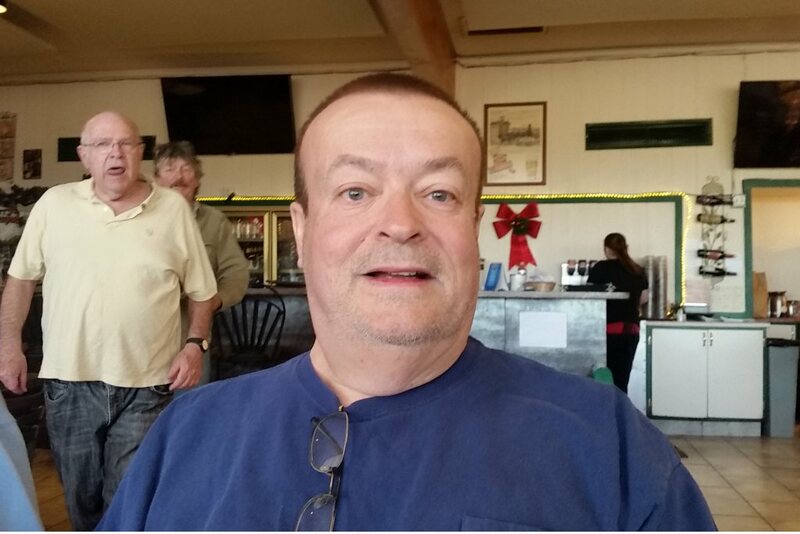 We had a nice group today with WA1KNX - Deano coming to Dave's at the last minute and then W7MD - Doc Damon showed at Argenziano's for lunch. We had a good time. How about the lamp that Frank made for Dave...nice! Meet KN7MUT - Buster, Protector of the N6YW Residence. There is a great pup! Anyway, N6YW - Billy has, over the last several weeks, been remodeling his shack and decided to have an open house today. In addition in seeing his new shack, we were treated to pizza and drinks. He showed us his collection of the Collins Operators QSL cards and we were given a royal tour of the place, including his overly filled garage where he displayed some of his junk. There were a couple of his special line of guitar amplifiers called "Red Jones". They were very nice, indeed. If you're interested, make sure you are well heeled enough to stand the freight, as I said, very nice. And don't forget the "Pajamas". Look for the special Antenna Paint, a product that is pretty hard to find on the market these days. I don't think even MFJ handles it. Very rare indeed. We did it again? 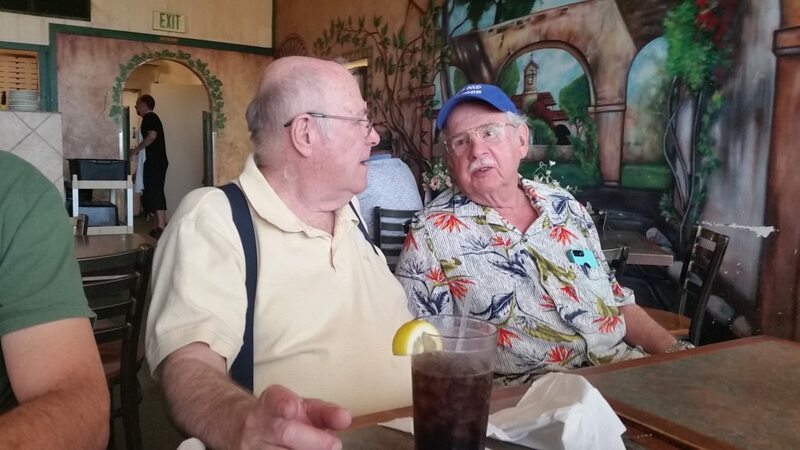 We had another meeting down in Corona de Tucson at AJ7O's QTH and ended up with a fine lunch at the Italian joint there. Don and W7MD - Doc showed up a bit late, but we had a good time, never-the-less. Don has retrieved a couple of pices of antique funiture that belonged to his father & grandfather. I just had to take a picture. 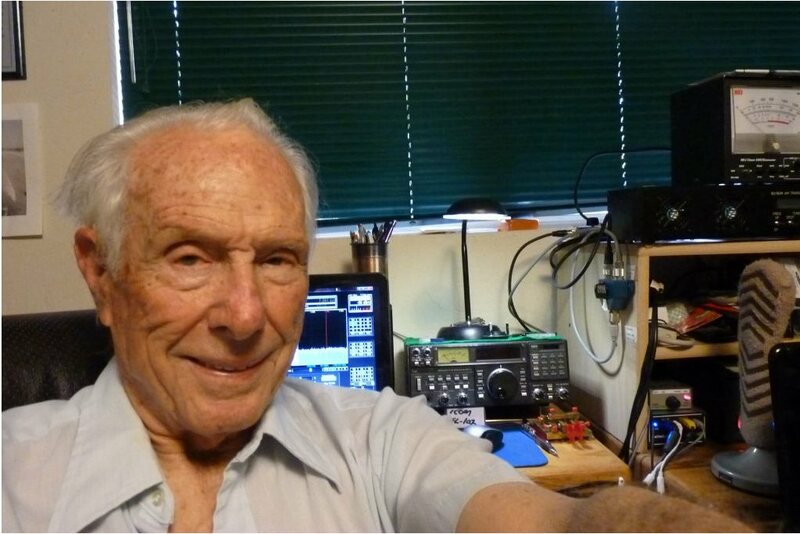 I was reminded by N6YW - Billy, that K6QL - Dave in Poway, California is a silent key some time back. 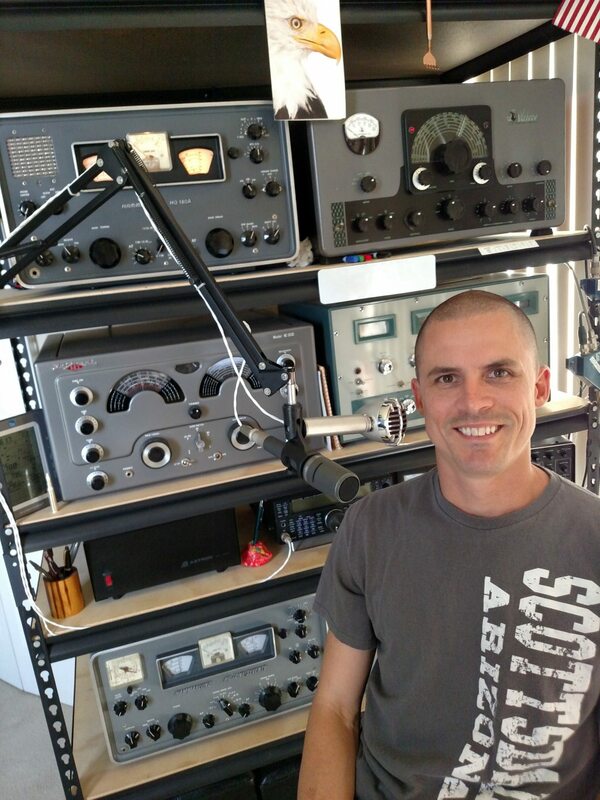 We're going to miss Dave and the QSOs on his AM gear. RIP Dave. Sorry to see you go! Sign the Guest Book! 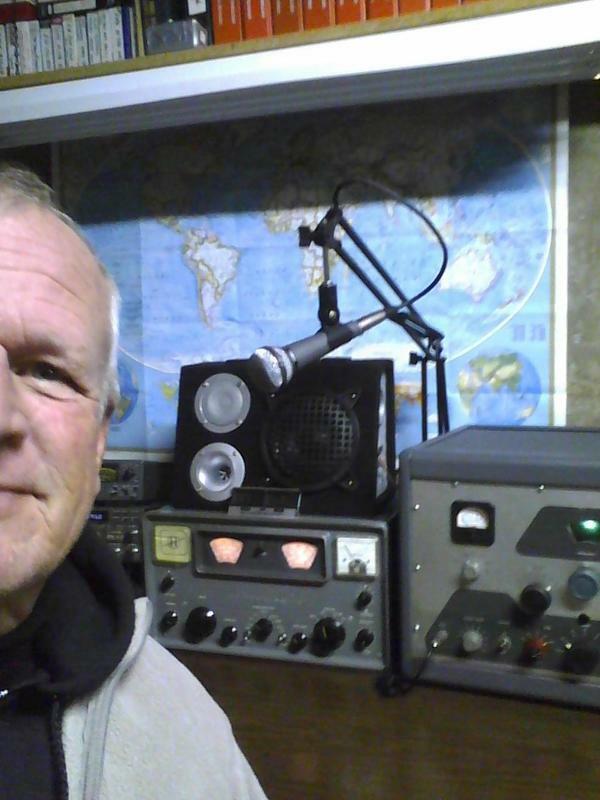 I had a nice QSO on 40 with N0GXM - Scott up in Sedalia, Colorado this morning and looking at his QRZ site, I found a couple nice pictues of his mobile setup and this 1/2 picture of him and his equipment. I asked him to send me a suitable picture for the gallery, but in the meantime, I though I'd have a bit of fun with this one. See the gallery!